Being in the presence of vines that predate automobiles, both World Wars, and the eight-hour workday (seriously… look it up!…) and that are still producing fruit… that’s a tough one to put into words. Communing with those gnarly, old souls – and that’s really what you’re doing if you visit as a wine geek – isn’t something you talk about so much as experience, which is probably why Randy didn’t say much about it and just insisted that we stop there first during our visit. And I know what you might be thinking… well, you write, don’t you? so at least give it a try, man! But the truth is that I have tried, five or six times, and every version fell short of the reality of being there, because it isn’t something that gets transmitted through the smell of the green cover crop, or the warmth of the air, or even the sight of the vines… it’s all of those things, and… something else, something more. Something that doesn’t make sense until you’re in the presence of living things that can easily outlast your time here on mama Earth, to which you’re literally little more than a transient specter. 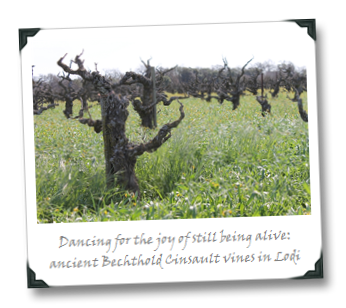 The Bechthold vines are borderline-ancient, but in such amazing shape that their twisted tendrils make them look as if they’re dancing, celebrating for the sheer joy of still being alive. 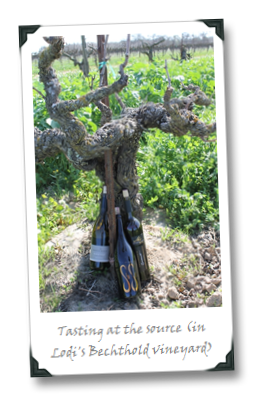 And the fruit still being produced by them is superb, if the finished wines into which they’re made are any indication. That the Bechthold vineyard survived the early 2000s, when the Bechthold family were getting a measly $200 a ton for its grapes (you can blame the location, and the fact that the grapes were labeled as “Malvoisie” – basically a price-killing combination in the CA wine biz), is a bit of a minor miracle. Wanda Woock Bechthold, now in her early eighties, had UC Davis check out the grapes, which were identified as Cinsault (took them long enough, didn’t it?) and were then pitched to higher-end clients (a list that now includes Bonny Doon, Turley Wine Cellars, Phoenix Vineyards and Michael-David), effectively raising the prices, justifying the farming costs, and saving the magic. I am going to tell you now that this wine catapulted itself into the running for the 1WD Most Interesting Wines Of The Year list on first whiff. This wine is like crack cocaine for Cinsault lovers (admittedly, all twelve of us…) – peppery, with understated, elegant red berry and dark cherry fruits… it’s deep, focused (as you’d expect from older vines producing intense, small berries), with plum fruits coming out towards the end of the sip and there’s a wonderful structure underneath it all that is both focused and vibrantly joyous at the same time (if that makes any sense). This is old souls showing how it’s done. Miner’s Leap has gone full-on pretty with this wine, focusing on the purity of the red berry fruit. It has depth as well, but femininity reigns supreme with this juice, and if you’re looking for the softer, contemplative side of Cinsault then this is your puppy right here. An honorable mention goes to the third wine that we tried in the vineyard on that sunny late February day, the 2006 Jessie’s Grove “Sin So” Cinsault (Lodi, about $35). It doesn’t get a badge because I don’t have a badge for “Ballser.” To make a long story short, winemaker Greg Burns (who is Wanda Woock Bechthold’s son) decided that, since Cinsault is one of the most anti-oxidative grapes, they would see how it held up against an oxidative treatment in the winery (the aging required accounts for why the 2006 is the current release). It’s a wine of dry fruits and flowers and caramelized notes, and is best described as an awesomely geeky experiment – one to try for the Cinsault-ultra-curious, but probably not one to pop open for your friends. "I will overlook the chance to make height jokes. I look down on people who do so and give them short shrift in conversation. Such behavior is beneath me." 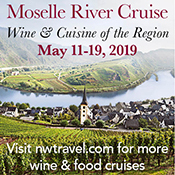 you are right – I never heard of this vineyard and never saw the old vines like this – definitely sounds like a place I would love to visit! 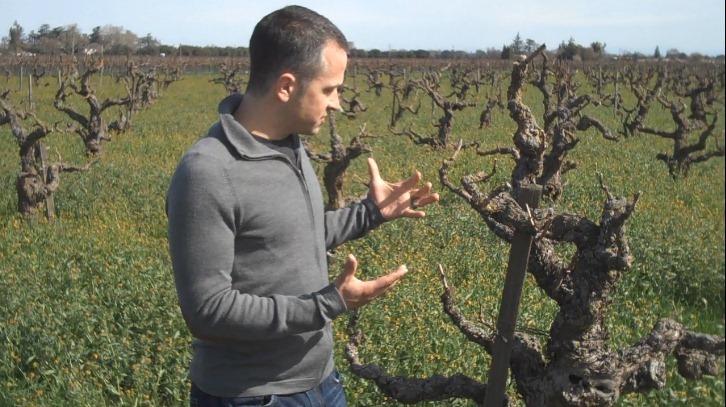 I really appreciate you taking the time to talk about the "old school" farming of Lodi and sharing it w/ the world with a feeling of open mindedness. Seeing it the way it used to be and not only amazed by it; but appreciating it. Lodi's where I currently call home & although I've only been here a few years, I fell in love w/ what was ancient & simple here in this "wine country of old". Ive witnessed 1st hand what you describe; It's hard to relay it's profoundness to others that have not stood in a vineyard & seen such old, Gnarly, elegant vines. You captured it extremely well in this post. 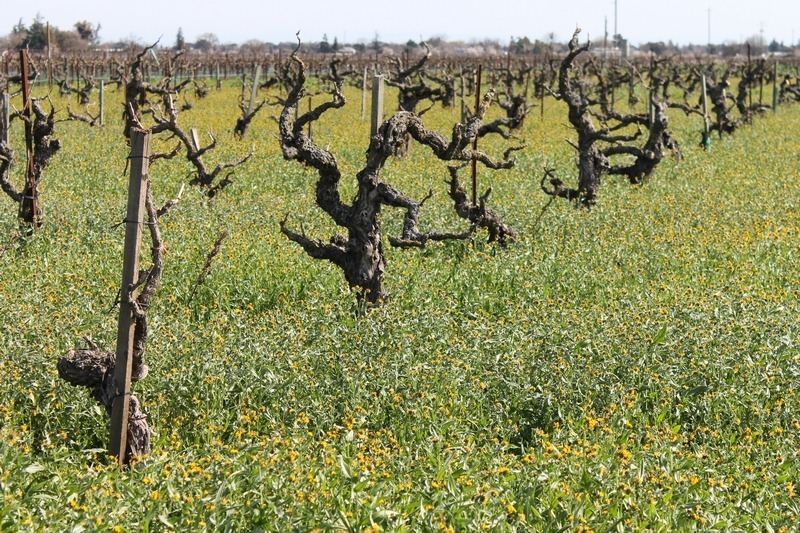 Thanks for reminding the wine folks how important Lodi, CA is to the wine community! Great Post! Cheers! Very cool. At Rhone Rangers this weekend Michael David had a 100% Cinsault (which was awesome) that they said was from 135 year old vines, but I don't exactly where they are. 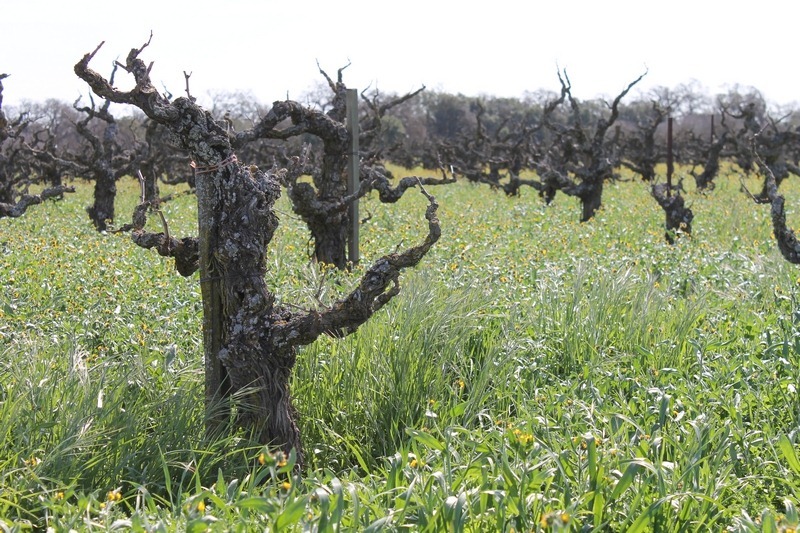 Also, Kunde Family Estate has 132 year old Zinfandel Vines in Sonoma Valley. 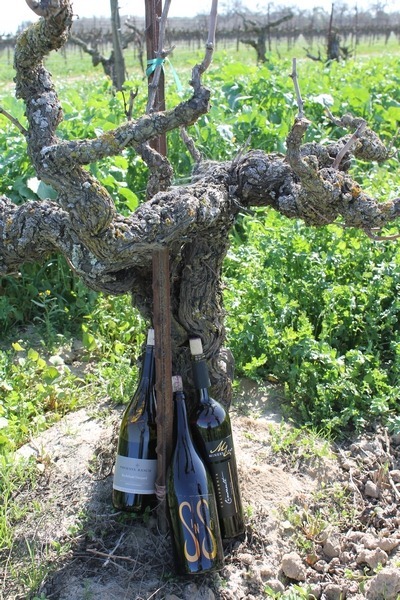 As you probably also know, Calistoga is home to some century old vines of various varieties planted by the early Italian settlers… many varieties that can't be determined too. Can't wait for the video. Ed, Michael-David makes their 100% Cinsault from the Bechthold 1886 Vineyard. 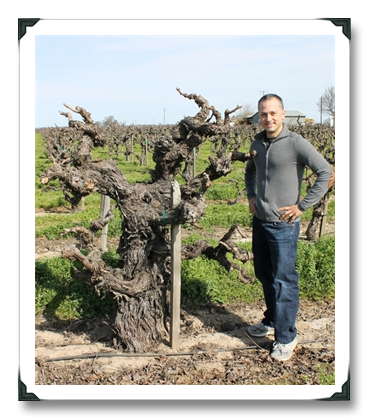 Kevin Phillips – the son of the "Michael" in Michael-David – farms the Bechthold vines for all those mentioned in Joe's blog. (Someone was just off in their math.) And as you mentioned, I've been a fan of Zin from Sonoma's Pagani Ranch, which I believe is one of the oldest in your neck of the woods. Thanks, Ed – not sure when it's posting at Wines.com but imagine it would be in the next few weeks. Cheers! Well, this is timely – video is published over at wines.com, so you can check it out now :). Michael Davids Cinsault comes from this same vineyard. Thanks again for visiting our home town of Lodi, Joe! Really appreciate all the attention you've focused on this very inspiring vineyard. Thanks for having me, Jon :). Hey Joe, kudos to you for the excellent post and your high level of journalistic integrity. You could have totally said you were standing next to a massive oak tree and people would've thought you amazingly tall. Great post Joe. Makes me want to try some Cinsault from Lodi. On a completetly shameless note, I wonder if they sell their grapes to home winemakers. Most likely not, but I have to ask. just started drinking a bunch of old vine Zin from Lodi. Enjoying it greatly!! Now there is a story! Thanks, Vinogirl – money well-spent there! 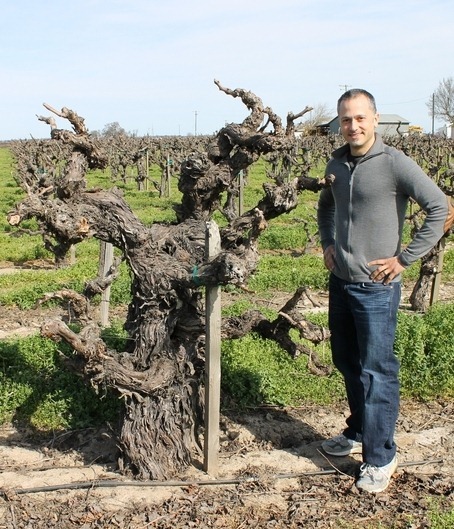 Love these gnarley, beautiful old vines! They are full of time-earned character, so cool! Veritable sculptures, and if they could talk…. Lisa – soooo true, such a great way of describing them! The Old Vine Term comes from and started from where? 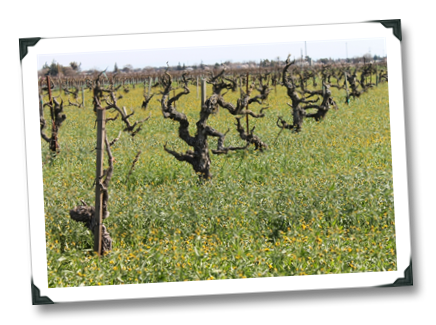 Wineguys – Dunno; my understanding of the genesis of the term in the U.S., just in terms of who first started using it on labels, is Dry Creek Vineyard in Sonoma.